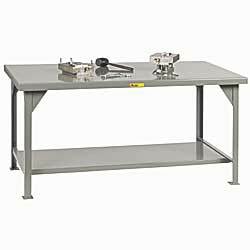 Extremely strong workbench is built to withstand heavy loads. Angle iron legs have extra large corner gussets for added strength and stability and foot pads with mounting holes to bolt to the floor. Reinforced steel top will not splinter or absorb liquids. FACTORY QUICK SHIPFOB ILLINOIS. 7-gauge steel top and lower shelf; 2x2" 1/4" angle iron legs. 3" square footpads have 5/8" mounting holes. 500-lb. capacity lower centered shelf. All-welded. Enamel paint finish. Color: gray. Choose fixed or adjustable height benches with legs that adjust on 1" centers. 12-gauge steel top; 1-1/2" x 1-1/2", 3/16" angle iron legs. Available with 500-lb. capacity lower half-shelf with 3" rear lip or without. All-welded. Enamel paint. Choose fixed or adjustable height benches with legs that adjust on 2" centers. ZK-3100 151	 36" x 30"
ZK-3101 187	 48" x 30"
ZK-3102 250	 60" x 36"
ZK-3103 287	 72" x 36"
ZK-3096 124	 48" x 30"
ZK-3097 153	 60" x 30"
ZK-3098 174	 60" x 36"
ZK-3099 201	 72" x 36"
YK-3100A 151	 36 x 30"	 34-3/16"
YK-3101A 187	 48 x 30"	 34-3/16"
YK-3102A 343	 60 x 36"	 34-3/16"
YK-3103A 287	 72 x 36"	 34-3/16"
YK-3104A 421	 84 x 42"	 34-3/16"
YK-3100B 176	 36 x 30"	 28-3/1638-3/16"
YK-3101B 212	 48 x 30"	 28-3/1638-3/16"
YK-3102B 343	 60 x 36"	 28-3/1638-3/16"
YK-3103B 350	 72 x 36"	 28-3/1638-3/16"
YK-3104B 446	 84 x 42"	 28-3/1638-3/16"
YK-3096A 124	 48 x 30"	 36-1/8"
YK-3097A 153	 60 x 30"	 36-1/8"
YK-3105A 201	 72 x 30"	 36-1/8"
YK-3098A 174	 60 x 36"	 36-1/8"
YK-3099A 201	 72 x 36"	 36-1/8"
YK-3106A 224	 84 x 36"	 36-1/8"
YK-3096B 126	 48 x 30"	 27-1/841-1/8"
YK-3097B 155	 60 x 30"	 27-1/841-1/8"
YK-3105B 188	 72 x 30"	 27-1/841-1/8"
YK-3098B 176	 60 x 36"	 27-1/841-1/8"
YK-3099B 203	 72 x 36"	 27-1/841-1/8"
YK-3106B 225	 84 x 36"	 27-1/841-1/8"